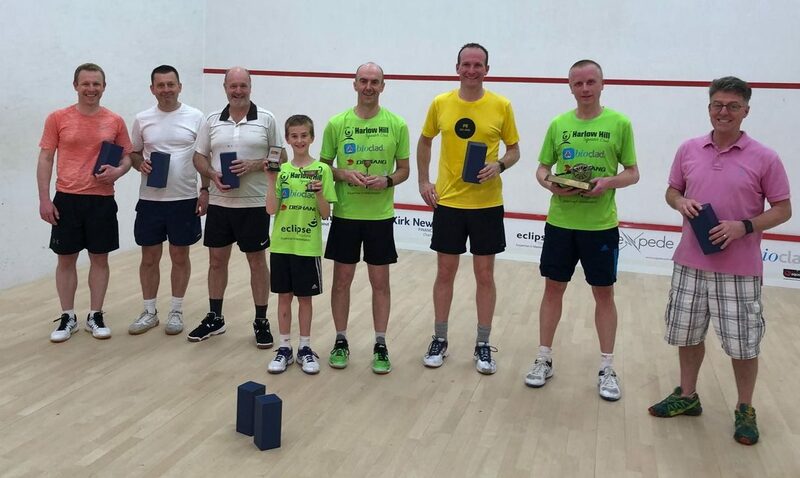 From left to right: Seth King (veterans runner-up), Roger Bikerdike (club & veterans plate runner-up), David Taylor (club plate winner), Tommy Simpson (junior champion), Steve Smith (veteran winner), Richard Leonard (club runner-up), John Simpson (club champion) and Lindsay McKenzie (veterans plate winner). John Simpson took his third consecutive Club Championship title by 9/5, 4/9, 9/2, 1/9, 9/5, against the eight-time champion Richard Leonard. It was a fantastic final with the matches to-ing and fro-ing one way and then the other! Like father, like son, Tommy Simpson becomes the Junior champion with a 3-1 victory over Toby Watts. These are two juniors to watch for the future. 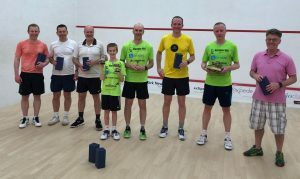 Club Coach, Steve Smith won his third Veterans title but this time against Seth King. There were also wins for David Taylor (Club plate), Lindsay McKenzie (Veterans plate) and Ella Rowell (Junior plate) finals. TOMMY SIMPSON ON THE ROAD TO THE TOP!